Maybe you need some money to fund the renovation of your home's 1970s-era kitchen. Or maybe you need a quick chunk of cash to pay down high-interest credit card debt or help pay for your kid's college tuition. Should you get that cash from a loan or a line of credit? You may wonder what difference it makes, but there actually is a difference. And both forms of borrowing come with positives and negatives. Before you take out either a line of credit or a loan, it's important to understand the key differences between the two. The main difference between a loan and a line of credit is in how the money is dispersed with each option. In a loan, you'll receive a single lump-sum payment. You pay back the money you've borrowed, with interest, each month over a period of years. Taking out a mortgage to finance the purchase of a home is a good example. Your lender provides you with a single payment that you use to buy your home. You then send a check to your lender each month, paying back the principal balance of that loan along with interest. Other common types of loans include auto loans, student loans, and personal loans. In all of these products, you're given a big chunk of cash that you steadily pay back with regular payments. With a line of credit, a lender approves you for a maximum amount of dollars that you can borrow. But you don't have to borrow up to the maximum. You can instead borrow whatever you need to pay for home improvements, paying off other forms of debt, helping your children with their college tuition, or whatever other expense you need the money for. 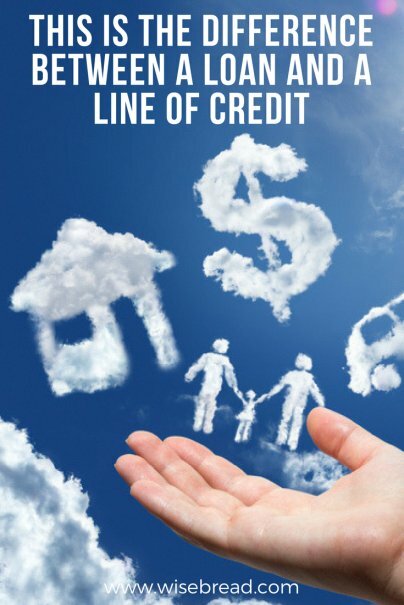 With a line of credit, you only pay back what you borrow. A home equity line of credit, better known as a HELOC, is a good example. Your lender will approve you for a maximum amount that you can borrow based on the equity you've built up in your home. Say you have $100,000 of equity in your home. Your lender might approve you for a line of credit up to $80,000. With a typical loan, you usually know what your payment will be each month. If you borrow $20,000 to buy a new car, you'll make the same payment each month — a payment in which your dollars will go toward paying down your principal balance and paying off interest — until you've repaid the loan. With a line of credit, your monthly payment will vary depending on what you've actually borrowed. If you've only borrowed $10,000, your monthly payment will be smaller than if you've borrowed $50,000. The exception with loans, though, can come with a mortgage. Even if you take out a fixed-rate mortgage in which your interest rate remains the same over its life span, your monthly payment could fluctuate. That's because lenders usually require borrowers to also include payments for homeowners' insurance and property taxes with their mortgage checks. If your taxes or insurance costs rise or fall, your monthly payment might fluctuate. Your mortgage payment could also change if you take out an adjustable-rate mortgage. With these loans, also known as ARMs, your interest rate will change during the repayment period, causing your monthly payment to rise or fall accordingly. Loans tend to come with lower interest rates than lines of credit. As an example, Freddie Mac, in its primary mortgage market survey, said that the average interest rate on a 30-year, fixed-rate mortgage as of the week ending April 26 stood at 4.58 percent. For a 15-year fixed rate mortgage, the average rate was 4.02 percent. At the same time, home equity lines of credit are currently averaging interest rates of over 5 percent. You'll usually spend more upfront to take out a loan than you will to originate a line of credit.